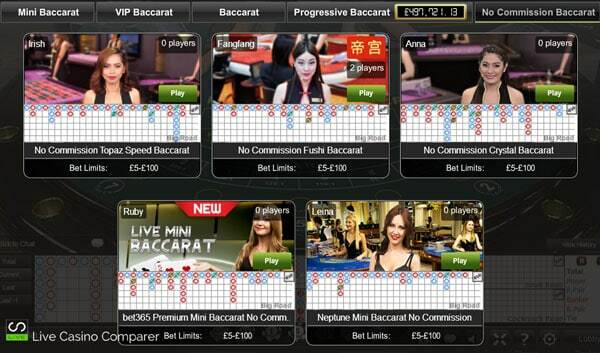 Playtech have added No Commission Baccarat to some of its Baccarat tables. In normal Baccarat you pay 5% commission on your winnings if you’ve bet on Banker and it wins. That’s the built in house edge. But in No Commission Baccarat there is no 5% to pay on wins. You get paid 1:1 (even money) if the Banker wins unless the Banker scores a 6. In that case you are paid 0.5 : 1 on your winnings (half your original bet). So what’s better? getting paid even money rather than 0.95:1 for all wins except when it’s a six! You’ll find No Commission Baccarat at Bet365.